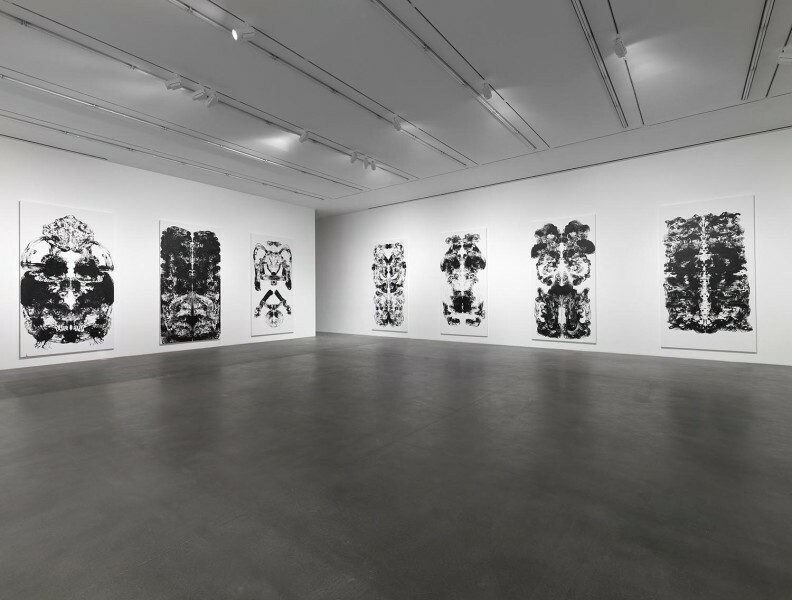 Mark Wallinger, ID, installation view, Hauser & Wirth London, 2016. Photo: Ken Adlard. © Mark Wallinger. Courtesy the artist and Hauser & Wirth. 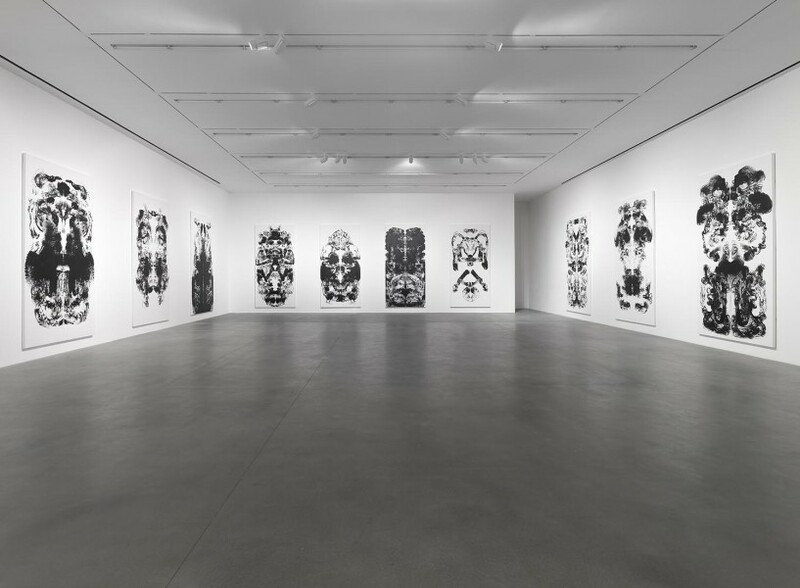 Identity, as constructed through class, race and sexuality, has been the central theme of Mark Wallinger’s work since the beginning of his career in the late 80s. In 1992, in the second of his Young British Artists shows, Charles Saatchi devoted a whole gallery of his vast Boundary Road space to Wallinger’s series of 1:1 scale portraits of thoroughbred racehorses, a work that alluded to breeding and genealogy as well as the wealth that flows through and from the business of racing. Ecce Homo, 1999, arguably the most successful of all the Fourth Plinth projects to date, placed the figure of Christ on the corner of Trafalgar Square. A life-size figure of a man, wearing a golden crown of thorns, Wallinger’s purposely un-heroic scale figure was dwarfed by its surroundings and potently positioned man in relation to God, as well as in relation to the assembled bronze heroes of the square. 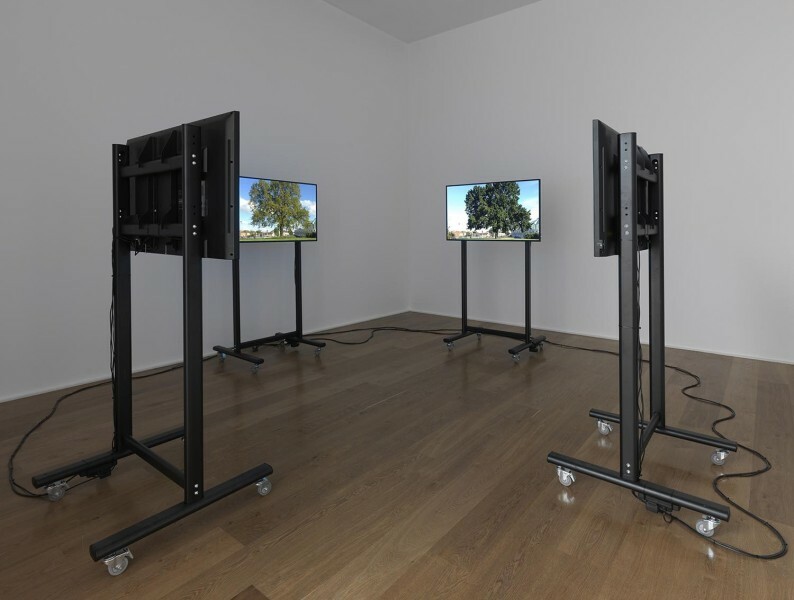 Wallinger’s first show with Hauser and Wirth demonstrates the continuity of his concerns, with compelling new permutations. 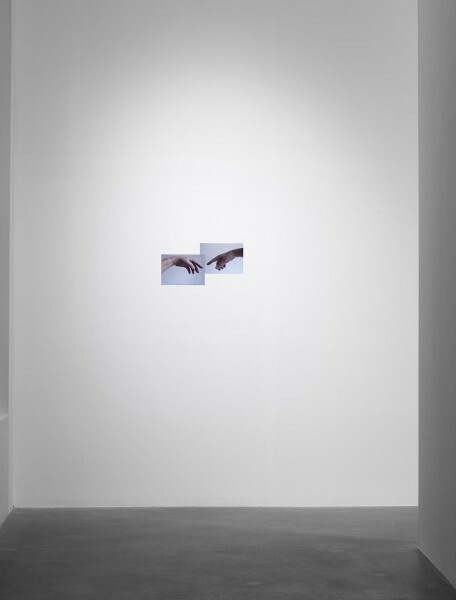 The title ID carries ominous 21st century connotations of surveillance culture. The overarching idea of control is underlined by the only three dimensional work here, Superego, 2016, which takes its form from the world-famous sign for London’s New Scotland Yard. A rotating, mirrored triangular shape on a tall pole, the sculpture elides Sigmund Freud’s term for the part of the psyche that controls our more animalistic impulses, with the forces that police us as a society, or more specifically a city. A Londoner all his adult life, Wallinger’s 2011 film Shadow Walker follows the artist along Shaftesbury Avenue, capturing his shadow as it slides over pavements and curbs, temporarily a part of the fabric of the street. He is an artist who has regularly used himself in his works, and Shadow Walker is typical in doing so in a way that is oblique and ambiguous. 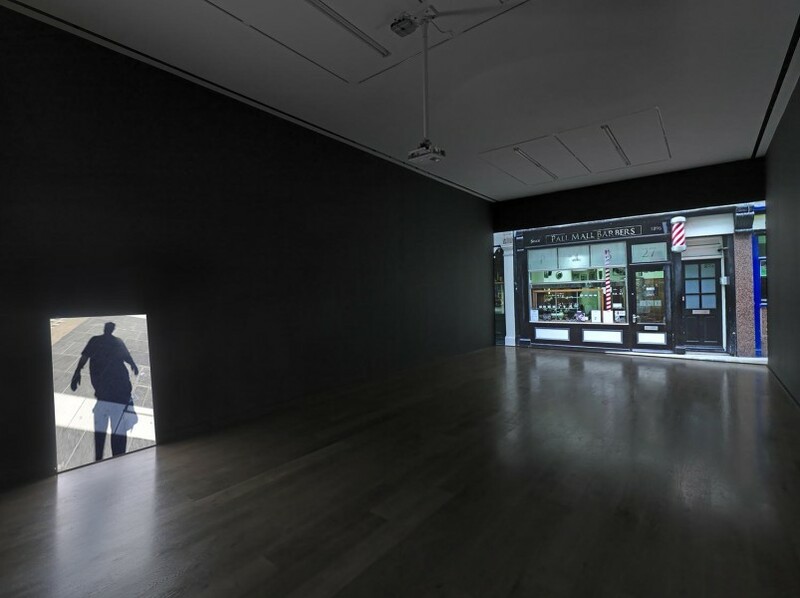 Think of Wallinger’s videos Sleeper, 2004 in which he dressed up in a bear costume in Berlin’s Nationalgalerie, or Angel, 1996 in which he appeared as Blind Faith with dark glasses and white cane. 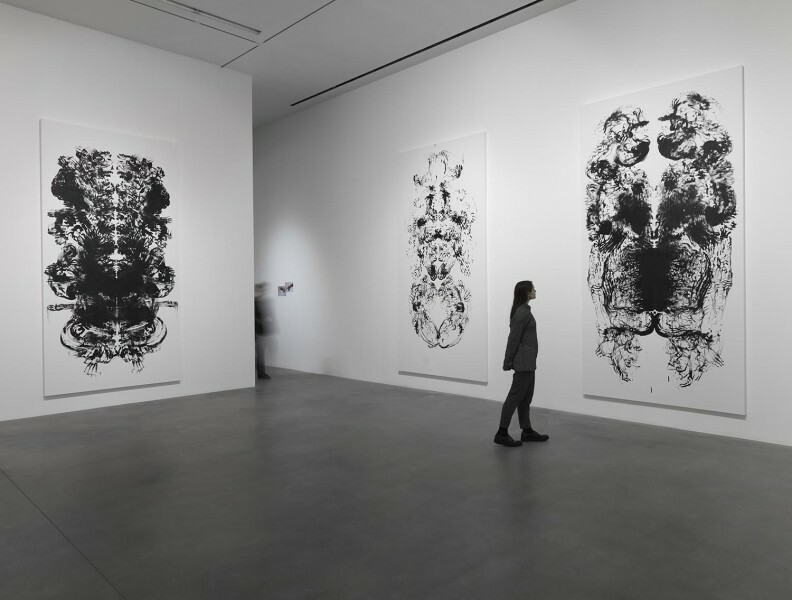 Hauser & Wirth’s north gallery is devoted to the new series of id Paintings, unlike anything Wallinger has done before. Each of the 17 canvasses here is an index of the artist’s body, double his height and as wide as the compass of his arms. Leonardo’s Vitruvian man is invoked, but is only one of a myriad references that circle around these imposing works. Created with great handfuls of blackest paint, each composition is different but each one is as neatly symmetrical as a Rorschach test, or the hemispheres of our brains themselves. Through sooty clouds or delicate curlicues of finger painting like wisps of smoke, the paintings have a dark, heraldic quality that sends the viewer from one to another, seeking differences and likenesses. These are hugely powerful works, but lest they appear hubristic, Wallinger has prefaced the group with a work made of A4 digital prints from photos taken on his iPhone. Mimicking Leonardo’s Creation of Adam in the Sistine Chapel ceiling, Wallinger has used his own hands for Ego, 2016: we are all our own creation. Circularity is another characteristic of Wallinger’s work that can be tracked back to earlier pieces. Here the four channel film Orrery, 2016 puts me in mind of the looping quality of earlier films such as When Parallel Lines Meet at Infinity, 2001, or the aforementioned Angel, 1997. An orrery is a model of the universe, showing the rotation of the planets; Wallinger’s film stays wittily a little nearer to home, endlessly navigating the Fullwell Cross roundabout in Barkingside, Essex. Filmed across the four seasons of the year, the camera focuses on the New Fairlop Oak, planted in 1951 to replace a tree that had stood for centuries in Hainault Forest. Wallinger’s genius is to take the seemingly banal and use it to jerk us out of the everyday towards a more acute understanding of where we stand – in the great scheme of things. That he does this with such humour and lightness of touch is what makes the work so enormously rewarding.